"Engaging, sincere, and delightfully friendly, Jake Richards brings the unified spirit of all magick workers into your hands. A must have for those interested in folk magick practices, whether for educational enlightenment or practical use. Fresh and honest, Backwoods Witchcraft brings the power home." � Silver RavenWolf, author of Solitary Witch and The Witching Hour. 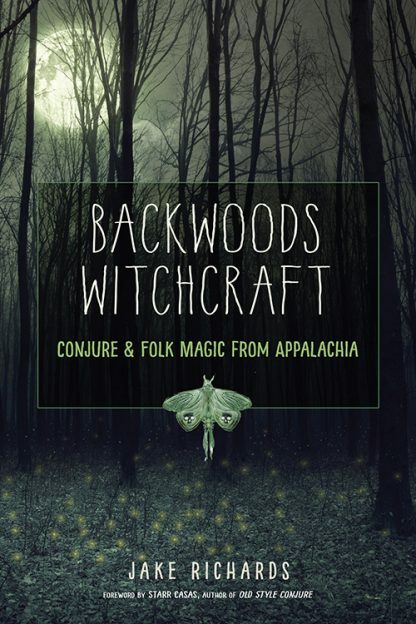 In Backwoods Witchcraft, Jake Richards offers up a folksy stew of family stories, lore, omens, rituals, and conjure crafts that he learned from his great-grandmother, his grandmother, and his grandfather, a Baptist minister who Jake remembers could �rid someone of a fever with an egg or stop up the blood in a wound.� The witchcraft practiced in Appalachia is very much a folk magic of place, a tradition that honors the seen and unseen beings that inhabit the land as well as the soil, roots, and plant life. The materials and tools used in Appalachia witchcraft are readily available from the land. This �grounded approach� will be of keen interest to witches and conjure folk regardless of where they live. Readers will be guided in how to build relationships with the spirits and other beings that dwell around them and how to use the materials and tools that are readily available on the land where one lives. This book also provides instructions on how to create a working space and altar and make conjure oils and powders. A wide array of tried-and-true formulas are also offered for creating wealth, protecting one from gossip, spiritual cleansing, and more. While Jake Richards doesn�t hold initiations, titles, or degrees, he clearly does hold his Appalachian heritage close to his blood and bones. He has practiced Appalachian folk magic for almost a decade and teaches classes on the subject in Jonesborough, Tennessee, where he owns Little Chicago Conjure, a supplier of Appalachian folk magic supplies and ingredients.